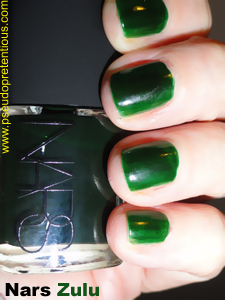 i’ve been lusting after this [discontinued then re-released] nail polish for a while but NOW I HAS IT, SO HAH! this is two coats. i really need a third coat and some SECHE VITE top coat, but check out this two-coat colour! after i apply the third coat, it works out to be a deep, dark, glassy, green, and i’ve become very fond of it rather quickly. i had to remove the pink nail polish from my fingers in order to try out the new green, but i really like the pink polish it too so i painted my toes pink. hibiscus happiness pink to be exact. ta-da! so yeah, i like my nail polishes… but i also like my knives. maybe i’ll make my next post about knives. it is a delicate balance, you know.